Arizona House representatives dropped the Equal Rights Amendment (ERA) into the hopper on January 11, 2017. 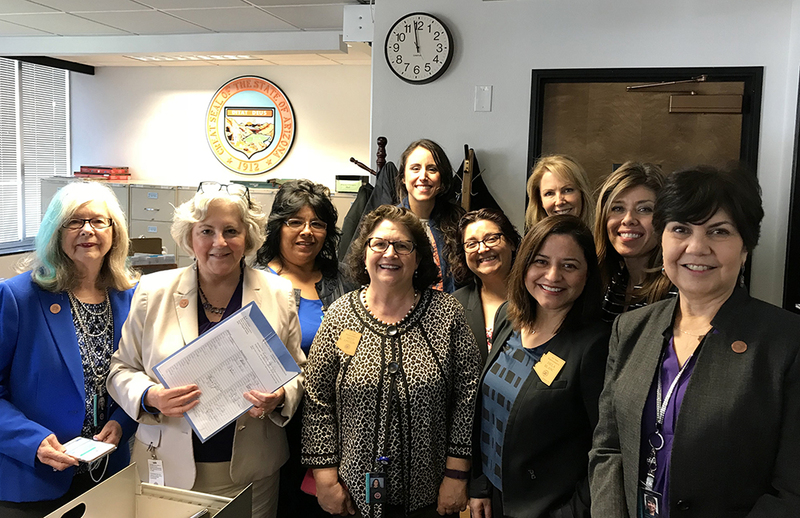 Arizona House representatives dropped the Equal Rights Amendment (ERA) into the hopper on January 11, 2018. In 2017, the Equal Rights Amendment was introduced in eight states, debated in three, and ratified in one– Nevada. The Arizona Legislature was one of the bodies that debated the ERA. (Watch the video.) I have vowed to introduce the ERA every year until it is ratified by the states. Only two more states are needed. This could be the year the ERA is finally sent back to Congress to become an amendment to the US Constitution. In 2018, the ERA is coming in the front door of the Arizona Legislature. 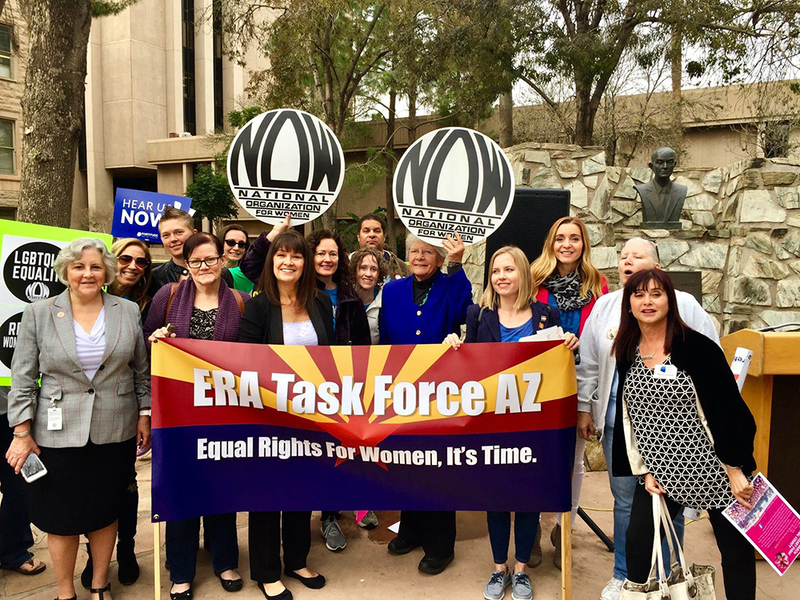 Many statewide groups are backing ratification of the ERA in Arizona– including the National Organization for Women (NOW), the League of Women Voters, the American Association of University Women, the Federation of Democratic Women, Progressive Democrats of America (PDA), and more. Many of these groups showed up on opening day to rally for the ERA and have events planned for this session. The ERA needs state legislators to allow for debate and to vote for ratification. The ERA needs Congressional representatives and senators to eliminate the ratification deadline. Ask your legislators, Congressional representatives/senators, and candidates for elected office: 1) if they back equal pay and equal protection under the law for women and 2) if they will help us in this fight for equality. It’s been almost 100 years since the ERA was originally proposed. I look forward to working with Republican Reps. Ugenti-Rita and Carter and the Democrats to get this heard in 2018. 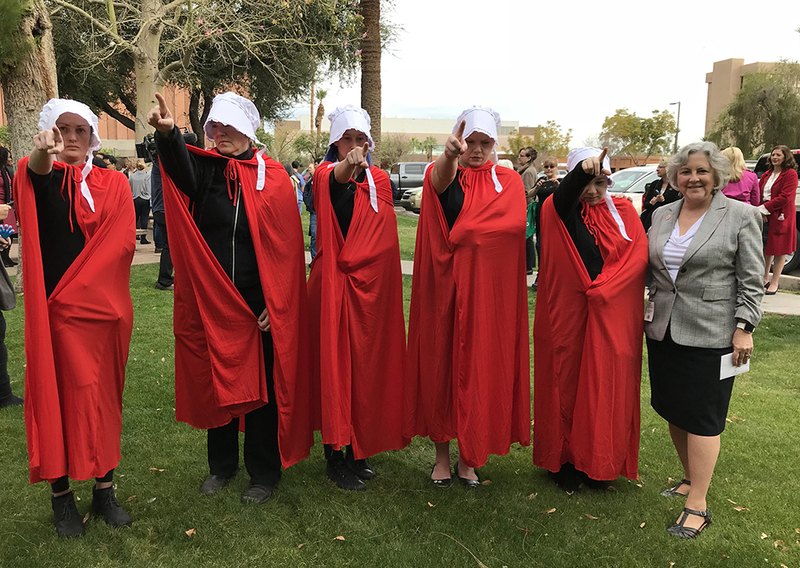 Even the handmaidens showed up for opening day at the Arizona Legislature. What an odd country we live in, where the ERA is controversial. The insecurity of old white men is the cause of much of the world’s problems. Luckily, there are so many women (and Democratic men) in the Arizona Legislature, that we can ratify the ERA without any votes from Republican men. It was interesting to listen to Governor Ducey tout the accomplishments of Arizona’s female politicians and not mention ratification of the Equal Rights Amendment. “…they imagine..” Must be Friday afternoon? Yeah, I don’t get it. In my various careers spanning decades, I’ve reported to women managers, I’ve had women on my teams report to me, I’ve had women as peers, as customers, as vendors and sales reps, and never once did I feel like I was “losing” anything. I can say the exact same thing about pretty much any race or religion you can think of, too, working in tech is like working at the UN, and I always thought it was a privilege to work with the smartest people from around the world. In fact, I’ve always felt that my career and future and life was 100% in my control, and I’ve never felt the need to blame women, brown skinned people, or immigrants, even when I competed against them, or felt the need to use laws or a Bible to get an edge. NT, you sound like a normal human being.